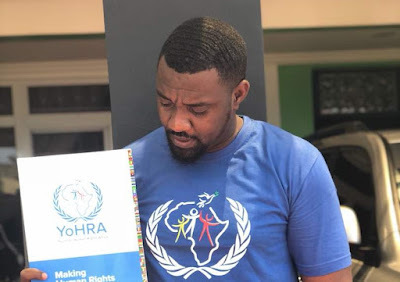 Continental human rights organisation, Youth for Human Rights Africa (YoHRA), has chosen Ghanaian actor John Dumelo as its youth ambassador. A Memorandum of Understanding (MoU) signed on 17th April, 2018 to this effect indicates that through the partnership with YoHRA, Mr. Dumelo would use his wide social media, corporate networks, and international appeal to rally support to advance human rights in Ghana and on the continent of Africa. “YoHRA finds the collaboration with Mr. John Dumelo, who is desirous of being a strong advocate for the promotion and preservation of fundamental rights through entertainment, to be very strategic,” it states. Mr. Dumelo on the other hand, has promised to use all his platforms to raise the necessary support for the works of YoHRA especially the 2nd Annual Ghana Youth Human Rights Conference 2018, scheduled for 1st to 3rd November, 2018. Mr. Dumelo is also a philanthropist and the Founder of The Dumelo Foundation. On his part, the President of YoHRA, Francis-Xavier Sosu was excited about the collaboration and was thankful to Mr. Dumelo for accepting the invitation to assist the project. “There are a lot of violations out there. Most of the victims and perpetrators alike lack education hence the continuous violation. I therefore find this collaboration very needful so we can mobilize the requisite logistics, human and financial resources to make human rights a priority in Ghana and other African Countries,” Mr. Sosu noted. Mr. Sosu also pleaded with the media, corporate Ghana, other individuals and organizations to unite with YoHRA to promote peaceful co-existence through their dedicated human rights education and advocacy.